In an exclusive phone interview on Tuesday afternoon, Sen. Marco Rubio (R-FL) warned that Democrats in Congress appear to be angling to move toward a single payer healthcare type system as the disastrous roll-out of Obamacare continues to march on. “Secretly and not so secretly, it’s a desire many on the left have had for a very long time,” Rubio said, noting that liberal Sen. Bernie Sanders (I-VT), chairman of a key Senate subcommittee, just held a hearing laying out the case for single payer Tuesday. “I believe single payer is always the goal that they wanted. In fact, I think Obamacare was designed to eventually lead us to that point. What I think you’re going to see now is as Obamacare begins to fail, instead of recognizing it as a failure, we need to back and embrace free market principles. I think you’re going to find the left increasingly saying that Obamacare’s failure proves we need a single payer system, so I’m not surprised by it at all,” he added. Recent history is replete with signs that top Democrats dearly desire a single payer system. President Obama vigorously backed it until around 2003 – and said that’s how he’d design the system “from scratch” in the 2008 campaign. House Minority Leader Nancy Pelosi, in October, said she “would’ve preferred single payer or public option” to the “compromise” that was Obamacare. Senate Majority Leader Harry Reid last summer infamously said Obamacare was “absolutely” a step toward single payer. “This is a government that struggles to deliver the mail accurately,” he said. “This is a government that struggles to provide veterans benefits to our men and women who have fought in uniform. Now you’re going to put them in charge of our entire healthcare industry? Make them the only insurance company in charge of getting you the care you need in a timely fashion? Put yourself in the place of a hospital or a doctor or an innovator coming up with new medicines or new treatments or new diagnostics or new procedures, once the government becomes in charge of that you’re going to get what you get in all of these countries where government dominates healthcare and that’s rationed medicine that’s lower quality with less choices,” he said. Rubio added that while much of the blame for Obamacare’s failures rests in its flawed policy prescriptions, some lies with President Barack Obama’s and Health and Human Services Secretary Kathleen Sebelius’ failure to regularly meet, as documented by the Government Accountability Institute (GAI). GAI found in a study late last year that from July 12, 2010, to Nov. 30, 2013, the president’s public schedule records zero one-on-one meetings between Obama and Sebelius. A subsequent story from The Hill, based on 750 pages of Sebelius’ draft schedules obtained under the Freedom of Information Act, found seven instances Obama had been scheduled to discuss health care with Sebelius over nearly a year and that Sebelius had attended other White House meetings as well. 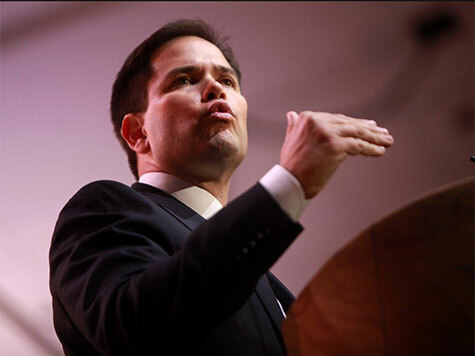 Rubio said the unusual dearth of interaction between the two principals is unsettling. Because of the massive failures of Obamacare and the still-lagging economy, Rubio said Senate Democrats are “scared of losing control of the Senate” and engaged in efforts to distract from the issues at hand. “You have somebody who has pledged close to $100 million on influencing races on behalf of Democrats in exchange for more of a focus on climate change,” Rubio said. “You have this all night production clearly designed to appease one mega-donor on their side even though they make it a career of attacking mega-donors on the other side,” he said. “But here’s the key question: When are they going to pull an all-nighter to talk about the people who have lost their healthcare coverage, pull an all-nighter to discuss the 20 million Americans who have given up looking for work or pull an all-nighter to talk about the lack of investment and innovation in America today because of our broken tax code and anti-business rhetoric of this administration and their allies in Congress? When are they going to pull an all-nighter to focus on issues impacting people on a regular and daily basis, as opposed to an all-nighter on behalf of a hundred million dollar donor?” Rubio said.